We all know that overexposure to the sun can cause harm. Sunburns are painful, and ultraviolet (UV) radiation is a contributing risk factor for skin cancer. But it’s not all bad. The sun’s energy is critical for life on Earth, and indeed, moderate exposure can play a positive role in our individual health as well. 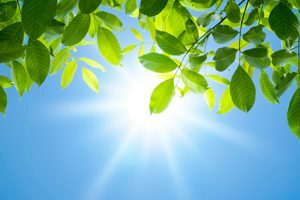 Exposure to UV-B radiation (highest during the midday sun) stimulates skin cells to produces vitamin D. This, in turn, helps the body absorb the important minerals calcium, phosphorous, and magnesium. Calcium in particular is important for maintaining strong teeth and bones. While no level of “tanning” is considered safe, fair skinned individuals can get enough vitamin D by spending just 5-10 minutes in short sleeves during the midday sun. Individuals with a dark complexion living in temperate climates such as the US can take up to 6 times longer to create the same amount of vitamin D. At that level of time in the sun you may be causing more harm than good, so be sure to include sources of vitamin D in your diet. During the winter months this applies to everyone, as UV-B radiation typically doesn’t penetrate the atmosphere enough to provide any vitamin D benefits. Often fortified in milk, soy milk, and orange juice. Fatty fish such as tuna, salmon, etc. Furthermore, a little time in the sun has been shown to elevate the mood and combat depression. So get a healthy dose of sun—it’s good for your smile in more ways than one!